Most people in the Roman Empire lived with their whole family in one room of a sort of small apartment house. These were built, like many cheap apartment houses in the United States today, around two or three sides of a courtyard, one or two stories high. The other sides of the courtyard had high walls to keep out burglars. Today we use these courtyards for parking, but Roman people (who didn’t have cars) used them for cooking, and for children to play in. The apartment houses were generally mud-brick, with flat roofs that you could sleep on in good weather. 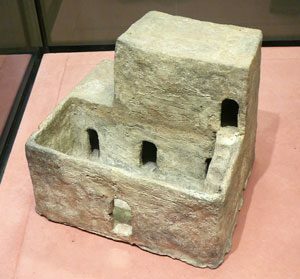 Poor people who lived in cities sometimes had this kind of apartment, but more often had to live in taller wood or brick apartment buildings called insulae, without any courtyard. Roman houses for rich people, at the beginning of the Roman Republic, were a lot like the houses the Etruscans lived in. Most houses had a front door leading into an atrium (AY-tree-um), or courtyard, and rooms all around the courtyard. Sometimes there was a roof over the courtyard, often with a skylight hole in the center to let in light, and to channel rainwater into a cistern in the middle of the courtyard. In the back of the courtyard, across from the front door, was the parents’ bedroom, or tablinum (tab-LINE-um). Later this became mainly an office, where you did business and sometimes ate with your guests. On the sides were the bedrooms, or cubicula (coo-BICK-you-lah). By the Late Republic, some Romans were beginning to build more Greek-style houses. These houses still had an atrium with rooms around it, but in the back they had a peristyle, or garden, with columns all around it, and more rooms around the peristyle. These are sometimes called atrium-peristyle houses. 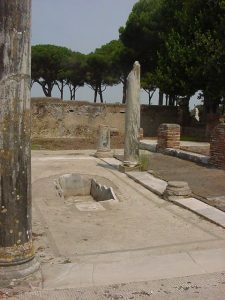 This is the peristyle of a house from the Roman town of Ostia. On the far side of the peristyle, there would often be a dining room, called a triclinium. Cite this page: Carr, K.E. Roman houses – Ancient Rome. Quatr.us Study Guides, August 27, 2017. Web. April 21, 2019.